In the wake of racial incidents such as the shooting at a Pittsburgh synagogue in October 2018, it’s natural for the public and pundits to wonder just how common anti-Semitism is. Deadly attacks on Jewish houses of worship are thankfully rare, but what about anti-Jewish belief among the general public? One often-used metric is public opinion polls about the Holocaust. 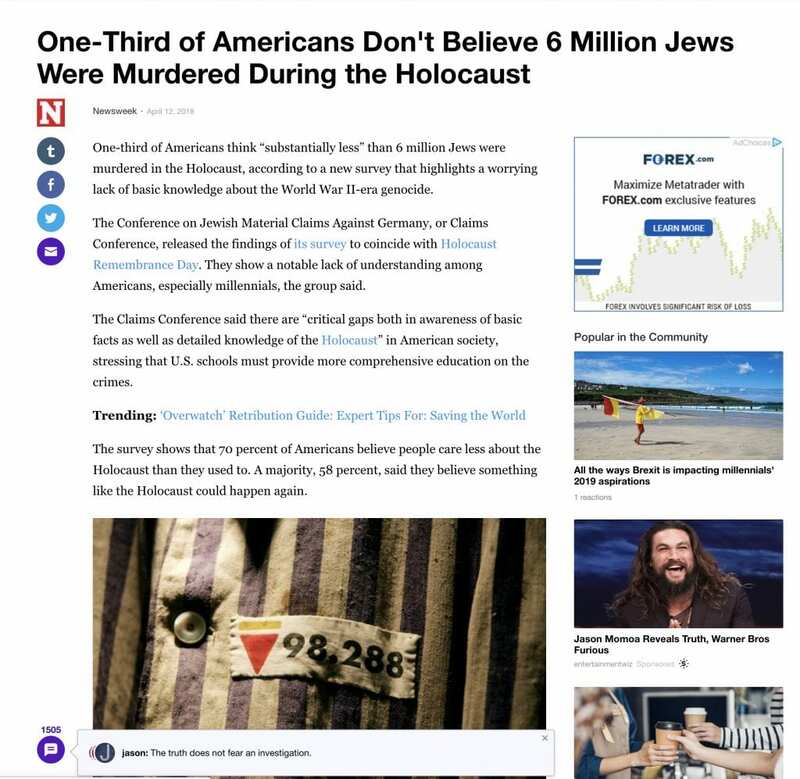 In April 2018 Newsweek posted a news story titled “One-Third of Americans Don’t Believe 6 Million Jews Were Murdered During the Holocaust.” It was widely shared on social media, including Yahoo News. The disturbing headline seemed to suggest that neo-Nazis are succeeding in sowing Holocaust denial among Americans. The Holocaust is the highest-profile event in history about the dangers of intolerance and anti-Semitism, and with about a third of Americans—over 100 million people—doubting a key aspect of the Holocaust, anti-Jewish sentiment seems widespread indeed. Given the potential fear and concern headlines like this can spawn, it’s worth taking a closer look at the story through the lens of media literacy and skepticism. The data came from a survey by Schoen Consulting on behalf of the Conference on Jewish Material Claims Against Germany, released for Holocaust Remembrance Day. It was a national study of 1,350 interviews with American adults during the last week of February 2018, with a margin of error at +/- 3%. If you actually read the study (available here) you realize that the Newsweek headline is misleading in several important ways. Phrasing is important, especially in surveys. 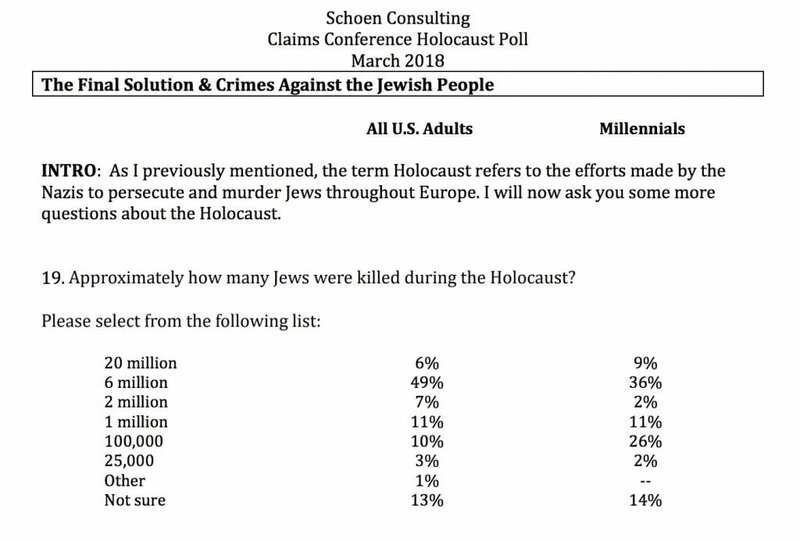 Had the question been phrased “Do you believe 6 million Jews were killed during the Holocaust?” then the percentage responding No would accurately capture how many doubt that six million Jews were killed. It should also be noted that there is in fact no historical consensus on the exact number of Jewish deaths in the Holocaust, but most experts believe the number is between 5 and 6 million. Had the question been phrased more accurately (by historical standards) and less precisely (by estimation standards), as in “Do you believe that about 6 million Jews were killed during the Holocaust?” it’s quite possible that even more people would have correctly answered that question. A closer look reveals that among American adults, the vast majority, 49%, gave the correct answer of 6 million. Six percent actually overestimated the number of Jews killed by over a factor of three (at 20 million). Note that the second-highest response, Not Sure, at 13%, means just that: they’re not sure how many Jews were killed in the Holocaust. Thus “Not Sure” is not a catch-all response for “None” or “An Insignificant Number” or “Surely Fewer Than 6 Million.” It could mean the person thought that the number was closer to 15 million, or 10 million, or 8 million, or some number not among those specifically listed. For all we know, many of that 13% could have accurately estimated that about 6 million Jews were killed, but weren’t confident enough in their grasp of historical facts to select that option. If that’s the case then the number who knew the correct answer could be over 60%. But we don’t know because of the way the question was worded. To be clear, this limitation doesn’t invalidate the question, or render the survey or its results flawed; it just means that we must be careful in interpreting the results—especially on a subject as important as Holocaust belief or denial. The poll does show that many Americans are wrong about various Holocaust facts (such as whether the Holocaust preceded World War II or vice-versa). How significant is this? It’s not clear. One common question in science is “Compared to what?”; in this case for example, what percentage of average Americans should we reasonably expect to know the answers? Eighty percent? Ninety percent? One hundred percent? We can all agree that ideally the answer is “higher,” but if many Americans are vague about historical events that happened in World War II, they’re not much more informed about what’s going on in modern America. A September 2017 poll of 2,200 American adults for Morning Consult found that about half of Americans don’t know that people born in Puerto Rico are U.S. citizens: 54% of adults said yes; 22% said no, and 24% said they weren’t sure. A 2007 survey by Kelton Research found that 80% of respondents could name the main ingredients of a McDonalds Big Mac sandwich, but fewer than 60% could recall all the Ten Commandments, and a 2010 Pew poll found that only 55% knew that the Golden Rule is not among the commandments. Exaggerating and highlighting the ignorance of Americans is a time-honored tradition, especially among journalists and comics. The Tonight Show with Jay Leno often featured man-on-the-street interviews showing passersby stumped by simple questions, and Canadian comedian Rick Mercer hosted a long-running segment on the same theme titled “Talking to Americans,” on the satirical comedy show This Hour Has 22 Minutes in which Mercer, posing as a journalist, would ask unsuspecting American tourists bizarre non-sequitur questions such as whether they supported hunting polar bears in Toronto or would like to congratulate Canada on moving its capital from Ottawa to Toronto. It’s all good flagellatory fun but obscures that fact that most Americans (that is, the statistical majority of them) are in fact fairly knowledgeable about their country and world history. Most people can answer such questions, and the fact that a minority of them can’t—or in many cases may know the correct answer just aren’t confident enough in their knowledge to commit to it on camera or to a questioner—reveals little about any uniquely American ignorance. Part of the issue is psychological. In his book Innumeracy: Mathematical Illiteracy and Its Consequences, mathematician John Allen Paulos notes that people have difficulty conceiving of large numbers. When estimating, people easily slip “between millions and billions or between billions and trillions… because we too often lack an intuitive feeling for these numbers. Many educated people have little grasp for these numbers… A recent study by Drs. Kronlund and Phillips of the University of Washington showed that most doctors’ assessments of the risks of various operations, procedures, and medications (even in their own specialties) were way off the mark, often by several orders of magnitude” (p. 10). This does not excuse anyone’s errors, of course. Ideally, everyone should have a good grasp of historical and civics facts, as well as basic statistics and probability. Before concluding that Americans are dumb as rocks, keep in mind that most people (of any nationality) struggle to remember their computer passwords, much less who their representatives are. Not knowing the exact number of Jews killed during the Holocaust is not a metric of Holocaust denial or anti-Semitism, or indifference to (or ignorance of) Jewish persecution. The Newsweek headline, however, was not merely a glass-is-half-full analysis but instead a clear effort to characterize many Americans as racist, or at least grossly ignorant of the plight of the Jewish community during the Holocaust (Brown University sociologist Dan Hirschman agrees, noting in a May 8, 2018 blog that the Newsweek headline “implies that 1/3 of Americans are Holocaust deniers of some sort”). These are people who didn’t pay attention in history class and who don’t have a good grasp of large numbers—not Holocaust deniers. The survey did not suggest that underestimating the number of Jews killed was any sort of attempt at minimizing the Holocaust. If we want to know how many Americans doubt the Holocaust happened, we need look no further than question 33, which unlike question 19 is not as open-ended: 96% of respondents answered “Yes, I believe the Holocaust happened.” Three percent said they weren’t sure, and 1% of them responded that they did not believe it happened. This 1%—not the 33% suggested by Newsweek—would presumably be among the Holocaust deniers. This is not the first time that a poll about the Holocaust produced alarming numbers. 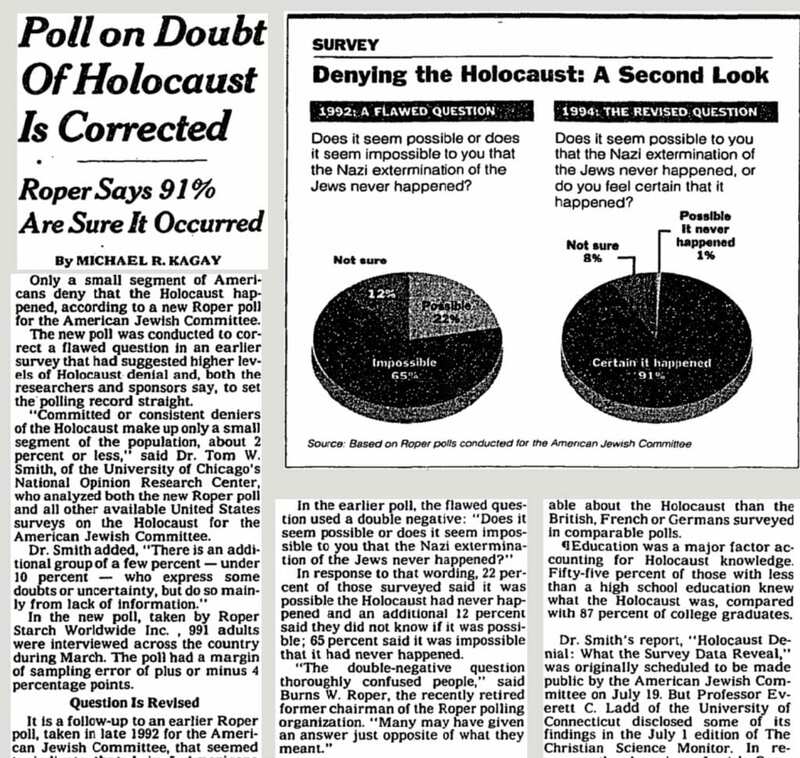 In one of the most infamous examples of flawed polling, a 1992 poll conducted by the Roper organization for the American Jewish Committee found that 1 in 5 Americans doubted that the Holocaust occurred. How could 22% of Americans report being Holocaust deniers? The answer became clear when the original question was re-examined: “Does it seem possible or does it seem impossible to you that the Nazi extermination of the Jews never happened?” This awkwardly-phrased question contains a confusing double-negative which led many to report the opposite of what they believed. 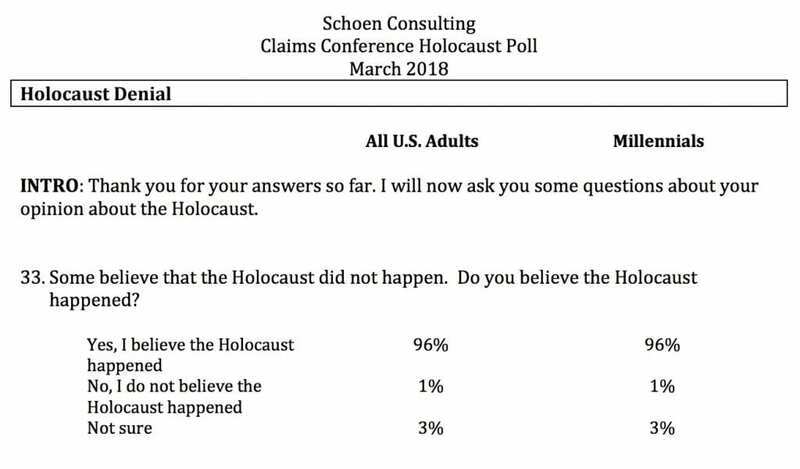 Embarrassed Roper officials apologized, and later polls—asking clear, unambiguous questions—found that only about 2% of Americans actually doubt the Holocaust. In fact the 2018 news headlines about the Holocaust poll could have accurately read “Holocaust Denial Drops 50%” (from 2% to 1%), but the news media emphasizes bad news. Polls and surveys can provide important information about the public’s beliefs. But to be valid, they must be based on sound methodologies, and media-literate news consumers should always look for information about the sample size, representativeness of the population, whether the participants were random or self-selected, and so on. Whether due to poorly-worded questions or an alarmist news media, reports like these leave the false impression that racism and anti-Semitism are more widespread than they really are. The recent rise in hate crimes against the Jewish community is well documented, but the recent rise in Holocaust denial is not.